Punch and die life can be extended considerably by prudent sharpening at the ideal time. The number of holes produced between sharpening will vary according to the material thickness and hardness from conceivably 400 holes on very heavy material to about 25,000 on thin material. Punches require more frequent sharpening than die buttons by almost two to one. On a new or sharpened punch or die, the shearing edges are square and sharp. These edges are rather fragile considering that they must withstand the impact and tonnage required for fracturing the material being punched. After considerable punching, observation of this edge will show a slight rounding (approximately .010″-.015″ radius), and will have a frosted appearance. This indicates that the metal in the immediate vicinity is fatigued. At this time the punch or die should be sharpened. Tools not sharpened at the proper time demand additional pressure on the cutting edges which will deteriorate more and more rapidly. This in turn will decrease the hole quality and the quantity of holes that can be produced by that punch or die. Therefore, frequent sharpening is by far the least expensive way to produce consistent high quality holes. 1125 Punch and Die Sharpener: To keep your tooling at peak performance, frequent sharpening will extend your tool life, lower the press tonnage you need and produce higher quality holes. 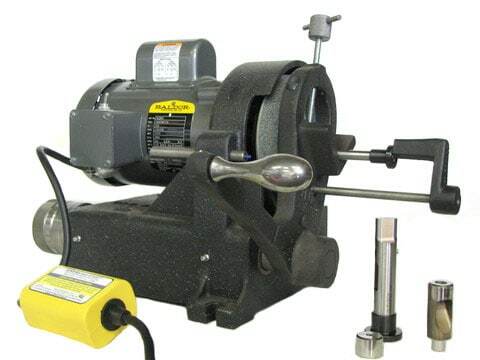 The UniPunch model 1125 bench style sharpener can be conveniently located near your press for quick tooling maintenance. Dies that have been sharpened in the field may need to be shimmed to sustain uniform die height.